Summary: Unfortunately, much of the good work is undone by a second half that seems to last as long as the Civil War itself, with action sequences that are not only overblown but serve as unnecessary padding. 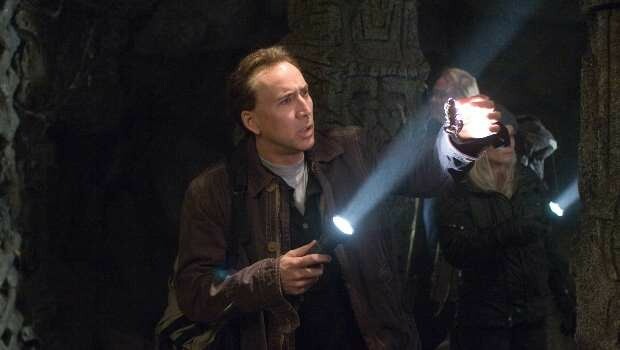 If ever a film warranted taking a video camera into a movie theatre, it’s National Treasure: Book of Secrets. Not for the purposes of piracy, you understand, but so that it can be available for repeated viewings that allow bamboozled reviewers to work out what the hell is going on. The first hour plays out like an extended and particularly convoluted episode of 3-2-1, as historian Ben Gates (Cage) jaunts around Europe trying to decipher the various clues he hopes will lead to the discovery of a treasure that will clear the name of his great-great-grandfather, who has been implicated by Ed Harris’ mercenary in the assassination of Abraham Lincoln at the end of the American Civil War. And that’s the simple version! Seriously, take a look at the sequence in Paris where Gates tries to get his head around an inscription on a statue – if Ted Rogers weren’t dead, the sight of him wheeling out Dusty Bin at the end of the scene would have surprised no-one. Quite why Gates is so determined to clear up a 140 year old mystery, to the extent of kidnapping the current president, is never adequately explained. But there are pleasures, derived not just from the film’s sheer absurdity, but from the easy banter and playful performances. Bartha’s dorky sidekick, Riley, hoovers up most of the best lines, while Voight and Mirren offer terrific value as Ben’s estranged parents. As a silly treasure hunt, punctuated by the odd burst of action or chase scene, NT: BOS works just fine. It doesn’t quite achieve the Indiana Jones levels of adventure it aspires to, but it’s certainly a lot more fun than The Da Vinci Code. Unfortunately, much of the good work is undone by a second half that seems to last as long as the Civil War itself, with action sequences that are not only overblown but serve as unnecessary padding. CGI, mercifully absent during the early stages, comes to the fore as the director realises he has to spend his budget on something, and assaults us with ugly, hard to follow action set-pieces that quickly wear out their welcome. And congratulations to you if you can keep track of whether Harris is good or bad in any given scene.